The Orion Molecular Cloud Complex is a region of nebulae, dark clouds and newly-formed stars the constellation Orion. After seven cold nights, an exhausted astrophotographer captured this beautiful photo of the Orion Molecular Cloud Complex. The complex is a region of a vast nebula containing dark dust clouds and newly-formed stars the constellation Orion. It has a range of bright and dark regions some of which can be seen with the naked eye. Astrophotographer Josh Knutson from Rio Rancho, New Mexico teamed up with Salvatore Grasso in June to complete post processing of this stunning night sky image. The night sky photographers made the image using a 200 mm SCT telescope. The image was made by taking a 28-hour exposure over seven days, with Knutson and Grasso collaborating in the post-processing work. 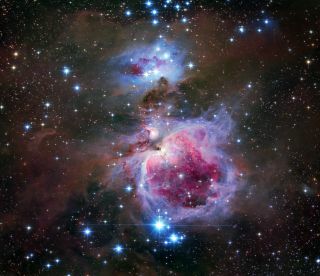 “Photographically the Orion Complex is one of the most difficult deep sky objects to properly image due to the extreme dynamic range of bright and dark regions which makes it a test of skill,” Knutson said. “The Orion image is my absolute favorite area of the sky as it contains so many different types of deep sky objects in one field of view,” Knutson said.